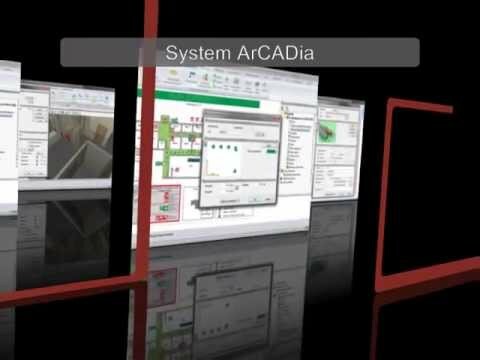 Basic tools of the ArCADia BIM system: COMPARING DOCUMENTS: •	This ArCADia tool enables the user to compare designs created in the ArCADia BIM system and to find the differences between them. •	This tool allows to include multiple designs of various installations in one document. •	The management of views and displayed information using the comprehensive Project Manager tree. •	The automatically created 3D view is available in a separate window to allow a presentation of the entire body of the building or e.g. a part of a level. •	Elements like walls, windows, doors, etc., are now inserted with the use of the intelligent tracking function. •	Selecting walls from defined types or setting of any specified composite walls. •	Heat transfer coefficient is calculated automatically on the base of the materials selected for the space dividers (walls, ceilings, roof). •	Inserting windows and doors by means of parameters from the program library and creating user-defined windows and doors. •	Automatic insertion of floors (according to a level outline). •	Automatic distribution of beams, transverse beams and ring beams on internal and external walls and on main beams. •	Automatic setting of a system of trimmers for openings and beams for partition walls. •	Automatic solving of a side ceiling access to a wall. •	Automatic calculation and setting of the required plane and offset grids. •	Automatic creation of rooms from closed outlines of walls and virtual walls. •	Temperatures and lighting requirements are automatically assigned to rooms, depending on their names. ArCADia PLUS 10 was added by rickzins in Aug 2018 and the latest update was made in Aug 2018. The list of alternatives was updated Aug 2018 There is a history of all activites on ArCADia PLUS 10 in our Activity Log. It's possible to update the information on ArCADia PLUS 10 or report it as discontinued, duplicated or spam. Discover the powerful and affordable CAD software that transforms 2D designs into 3D reality. Alternatives to ArCADia PLUS 10 for Windows, Mac, Linux, iPad, Web and more. Filter by license to discover only free or Open Source alternatives. This list contains a total of 25+ apps similar to ArCADia PLUS 10. I mainly use parts related to the design of plumbing and it is really good! Maybe some of the users will tell me how to transfer the bill of materials to Word, because I heard that it is possible. I was surprised to find how intuitive the program was while its complexity allowed me to do what I needed and more. It’s great that all the different installations ( electric, sewage, water, etc.) can be created in one BIM environment, so there is no loss of information when merging into a single project with the architectural plans. Good job!